The power of fusion is essentially unlimited and free of greenhouse gas emissions. A national team with Argonne National Laboratory (ANL) is making progress studying fusion as a source of electricity for this century. The most readily attainable fusion process on Earth takes place when two isotopes of hydrogen, deuterium and tritium, combine to make the common isotope of helium in a very hot ionized gas, called a plasma. Specifically, the products are energetic helium-4 (He4, which is also called an alpha particle), and a more highly energetic free neutron (n). 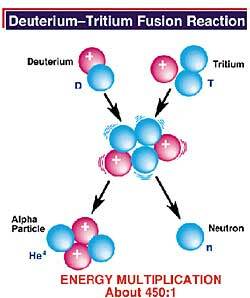 The helium nucleus carries one-fifth of the total energy released and the neutron carries the remaining four fifths. The relatively small amount of matter involved in the process is transformed into a large amount of energy in the form of heat. In a power plant, this heat would convert water into steam, which would create electricity by moving a turbine. and the nuclei fuse. In such collisions, energy is released. The 100-million degree plasma is too hot to be contained by any material, so the charged plasma particles are confined on magnetic field lines produced by powerful magnets. Too many impurities, including a helium "ash," or waste product, can quench the plasma and shut down the reaction. ANL is leading a project to solve the problem of removing this ash. Magnetic field lines near the edge of the plasma guide a small fraction of the plasma particles, including the helium ash, to a divertor region where they are removed by vacuum pumps. The diverted plasma particles, including the helium, strike metal divertor plates as they are pumped out of the plasma chamber. The plasma particles entering the divertor deposit high heat loads on the divertor plates and cause erosion, which can contaminate the plasma and limit the plates' lifetime. ANL researchers propose to replace the solid divertor plates with a flowing liquid metal to eliminate the erosion problem and to accommodate the high heat loads. Leading candidates for the liquid metal divertor are lithium and a mixture of tin and lithium. Gallium is another candidate. For more information, visit www.anl.gov. Fifty percent of Mexico City's 20 million inhabitants' water supply comes from aquifer withdrawal methods, but the aquifers are quickly depleting and threatening the future water supply. To address this critical issue, Battelle researchers at Pacific Northwest National Laboratory (PNNL) have partnered with experts from Mexico to develop a sustainable water management strategy. Battelle's Mexican Alliance Initiative is a collaboration of PNNL, the Autonomous Metropolitan University, the National Autonomous University of Mexico and the Mexican Petroleum Institute. The team has completed an assessment of injecting treated wastewater back into the aquifer and have developed a set of integrated simulations of the water system to evaluate potential actions. Project evaluations included social and health implications, costs and stakeholder involvement. "We're looking at this injection as one component of an integrated package," said Steve Shankle, Battelle Project Manager. Additionally, "Part of the process is to determine both from a public health perspective and from a public acceptance perspective, what the actual required level of treatment is. In the Mexico City activity, we will start off with a very aggressive pre-injection treatment program. One of the questions we are looking to answer is 'what is the actual required level of treatment?'" An anticipated two-year long Phase II of work will help develop a pilot program for injecting treated wastewater into the aquifer. This water would be treated to the standard of drinking water levels and then injected to reside in the aquifer for at least 12 months. Ten-thousand liters would fill the aquifer per second, compensating in part for the 16,000 liters per second being extracted. The aquifer will provide advanced tertiary treatment, biological treatment and storage. "The water that we will be injecting will be treated aggressively with today's technologies, but over the course of the eight-year period, we expect new technologies to be developed, so there is an explicit activities part of this project to bring in new treatment technologies into the process and get them tested and in place if they are appropriate," said Shankle. A finalized proposal of this Phase II is currently being drawn. In the United States, a similar process called aquifer storage and recovery (ASR) is already being used in an attempt to meet water demands in Florida. The Florida Department of Environmental Protection supports the technique, and legislation is under consideration to remove the requirement of pre-treating stormwater before underground injection. State officials say bacteria in the stormwater would not survive underground, and contamination of already existing underground water supplies would not occur. The National Academy of Sciences warns that questions about this methodology remain. Some trees seem to get excited when exposed to large doses of carbon dioxide (CO2). Specifically, Loblolly pines (Pinus taeda) have reproduced earlier and more abundantly in an experiment by Duke University biologists reported in Science magazine, vol. 292. The experimental tests utilize Free Air Carbon Enrichment (FACE) technology, designed in the early 1990s by scientists from Brookhaven National Laboratory on Long Island. Large vertical pipes release CO2 over six plots of mature Loblolly pines. Half the plants grow at ambient CO2 levels and the other half at the 560 parts per million (ppm) concentration expected by 2050. The biologists found that Loblolly pines grown for three years at higher CO2 are twice as likely to be reproductively mature and produce three times as many cones and seeds. The project confirmed that high CO2 levels can cause faster photosynthesis and growth in the species tested. Faster photosynthesis could mean faster conversion of carbon dioxide into oxygen. Because CO2 is a plant nutrient as well as a greenhouse gas, some researchers argue that faster growing trees of the future will absorb and sequester increasing amounts of CO2, making it unnecessary to impose new controls on the gas. Other scientists warn that the effects could cause dramatic changes in the composition of ecosystems worldwide. Early reproduction could cause the trees to grow old and die sooner. Scientists have hypothesized that faster growing species, such as pine, will respond more to elevated CO2 levels than will slower growing hardwoods. Among the Duke researchers' next steps is to examine the viability and quality of the seeds their experimental pines produced. They also are waiting for a handful of hardwoods growing in each plot to reach maturity so they can examine these trees' reproductive responses to CO2. The Loblolly pine is the species most frequently grown for timber production in the southeastern United States. Its wood has a wide range of uses, such as for building material, pulpwood and fuel. This article originally appeared in the June 2001 issue of Environmental Protection, Vol. 12, No. 6, p. 74.